Following attendance at the National Society of Fund Raising Executives (NSFRE) conferences in Atlanta, Georgia (1989 & 1992) and San Antonio, Texas (1991), Nancy Bartley, Development Director with High Sky Children’s Ranch and Lael Cordes-Pitts, LMSW, Executive Director of Casa de Amigos of Midland, Texas, Inc. met together with Susan Nichols, Development Coordinator (contract) to discuss formation of a local chapter. The three approached Laura Walker (McCabe), Executive Director of The Volunteer Center and it was agreed that an announcement would be made to gauge interest at a workshop scheduled at UTPB Center for Economic Energy & Diversity (CEED) in February 1993. The national office in Alexandria, Virginia appointed Regan Latham, CFRE, president of the Dallas NSFRE chapter, to meet with the group and mentor the Permian Basin Chapter for its first two years. A volunteer steering committee met with Regan during the Spring to organize the required paperwork and by July 1993, 18 charter members joined the new chapter. After electing officers, monthly program lunch meetings were held at the Confederate (now Commemorative) Air Force ‘pub’ room. Membership increased to nearly 40 and averaged 20-25 at the meetings. National speakers were brought in to make local training opportunities more readily available and affordable rather than travelling at greater expense throughout the state and nation. A restricted grant of $5,000 was given by the Davidson Family Foundation in 1995 to partially underwrite costs for the speakers. Meetings were later changed to UTPB CEED and then the Atmos Energy Richard and Sally Fischer Community Room when it opened in the late 2000s. The first National Philanthropy Day luncheon was held at Mission Dorado Country Club in November 1994 with 54 attendees. Year two was held at the Odessa Country Club with David Smith, Executive Director of the Abell-Hanger Foundation as keynote speaker; attendance doubled. Year three followed at The Petroleum Club of Midland where the event has primarily been held for several hundred attendees each year with a few luncheons scheduled at the Midland Country Club. Morning workshops with the national keynote speakers were offered for ‘add on value’ to members from 1995 into the 2000s. 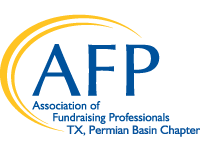 NSFRE changed its name to the Association of Fundraising Professionals (AFP) in 1999. Accordingly the local Permian Basin Chapter rewrote its Bylaws. Officers continued to include Executive Directors and Development Directors from throughout the area. Membership increased to 55-60 average over the years with attendees from Big Spring and Sanderson and even Abilene and Hobbs, NM from time to time. For its 15th anniversary in 2008, the chapter hosted the national organization’s President (who previously lived in Midland for a time) at a ‘members only’ breakfast in The Petroleum Club of Midland. Also in the late 2000s, the Midland College Students in Philanthropy Club was recognized for the Outstanding Youth Award at the international conference in Atlanta, Georgia. The chapter was awarded Ten Star Chapter recognition in 2010. A primary opportunity available through AFP annually has been the international conference which has increased to several thousand attendees as the development field has grown nationally. Locally up to a dozen members have attended each year and the chapter generously awards scholarships to multiple recipients to attend. Now approaching its 25th anniversary in 2018, the local chapter continues monthly meetings for development professionals in the fundraising field. Membership has remained steady while leadership completed a Strategic Plan in Spring 2015 and continues to focus on offering meaningful networking and training opportunities in the Permian Basin!